GPOD Tricks of the Trade! PLEASE DO NOT OVERFLOW DUMPSTERS! Lose debris can cause injuries to loved ones, neighbors and GPOD employees. An overflowing dumpster can also cause accidents on the road! GPOD clearly places “Do Not Fill Past This Point” stickers on each dumpster FOR YOUR SAFETY! We simply cannot take dumpsters that have been filled passed their limit. WE ARE BUSY SO WE CAN’T SHOW UP AT AN EXACT TIME! As much as we would love to be able to pick up your dumpster at 3pm sharp, each delivery takes a different, unknown amount of time. With traffic and other roadblocks it makes it impossible for us to give an exact time of pick up, so please be patient. If you call us the day of the delivery we can narrow the time down, so you can better adjust your schedule. Thank you so much for your understanding and patience. COMMUNICATE COMMUNICATE COMMUNICATE! Please don’t hesitate to call us any time with questions or concerns. 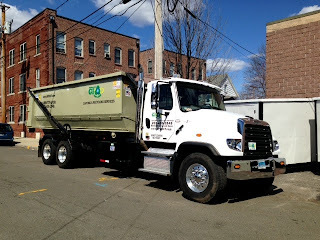 If you’re not sure about where to put your dumpster, what goes in it or anything else, one of our friendly employees will help you find those answers. There will be an additional charge if our drivers have to come back to your home for any reason, so write clear, precise directions, make sure the driver has easy access to the dumpster and let us know if you need the dumpster for a longer period of time. WATCH YOUR WEIGHT! If your dumpster is overweight there will be an additional charge, so be sure to keep an eye on this. Also, take water weight into consideration. Cover your dumpster when it rains, or allow a few days before pick up to let the dumpster dry out. WHAT CAN YOU PUT IN YOUR DUMPSTER? • Paint Cans - need to be DOUBLE BAGGED & PLACED ON TOP OF DUMPSTER. WHAT CAN’T I PUT IN YOUR DUMPSTER? Hazardous Waste materials: Pesticides, Oils, Fuels, etc. Here at GPOD we want you to have a great experience renting our dumpsters so be sure to keep these tips in mind!